Happy Black Friday! Hope everyone stuffed their face with turkey and pumpkin pie! I’m back in the Mitten state for thanksgiving with the family. This year I had the task of cooking Thanksgiving dinner since our master chef – my sister – had to work and save lives. I was super nervous because I didn’t want to ruin anything because my sister is an amazing cook – and I just don’t cook – but really I don’t. Thanks to her detailed instructions and guidelines I was able to make dinner and not poison anyone! As for the outfit – easy breezy and comfortable is my motto for Thanksgiving. I generally like to keep it simple with my Thanksgiving day look because I want to stuff my face with food. In addition I had to run around and get stuff done therefore I kept it simple with black pants, patterned top, flats, and my new favorite Haute Hijab cranberry scarf. I’m in love with this Anthro top because it is a brushstroke of autumn colors and screams Thanksgiving to me! Happy Friday and have fun shopping! May the black Friday deals be ever in your favor! ***Photos taken by Mo Aslani. Thanks! It's a Haute Hijab scarf! 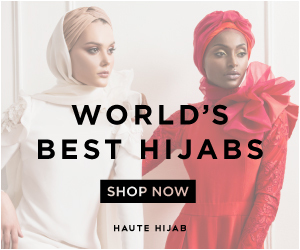 HH has the BEST hijabs! I have a drawer full of them!